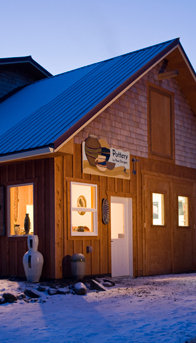 Paul’s studio gallery is located just a short distance from the center of Homer. Stop by to enjoy a large selection of Paul’s hand-crafted pottery and stroll through the gardens featuring one-of-a-kind sculpture and yard art. drive 5.5 miles east on East End Road. Turn left on Icy Bay Drive. Gallery is 4th house on the left. Paul Dungan Studio is just one of the galleries open on East End Road. CLICK HERE for more information about East End Road Artist.